Available at all healthnglow outlets and also you can buy in all beauty online shopping Websites like Medplusbeauty, flipkart, slassy, purple etc. There are 15 pretty shades available to choose. It comes in a long cubical transparent plastic packaging with silver colour screw open lid. The lid has a applicator wand which helps to apply the lip polish easily. It is travel and user friendly. 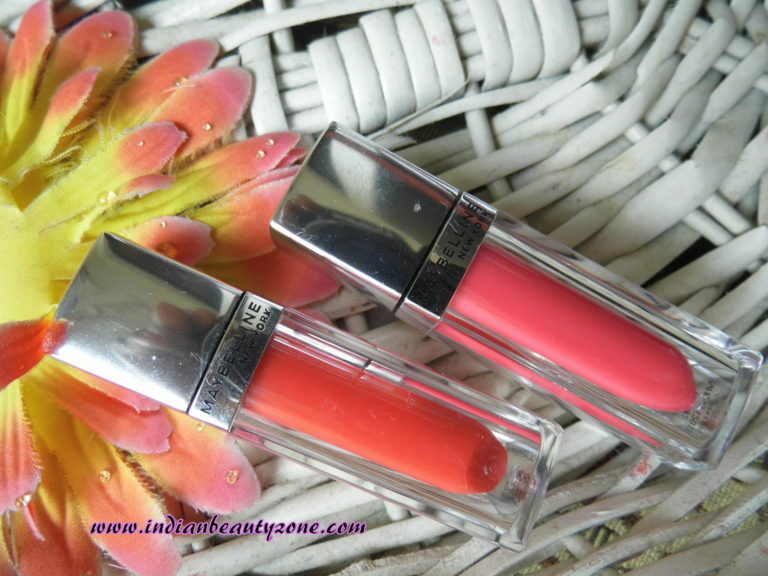 It has creamy and smooth texture which is easily glides on the lips without tugging your lips. The texture is neither liquid nor thick. I have noticed that the pigmentation varies from shade to shade. 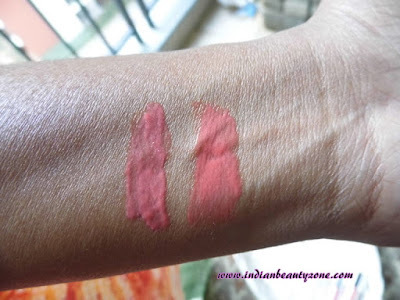 I have Glam 13 shade which has very good pigmentation and heard from bloggers that dark and bright shades of lip polishes are good in pigmentation. These two shades are light shades and doesn't shoes it's pigmentation effectively on dark lips. 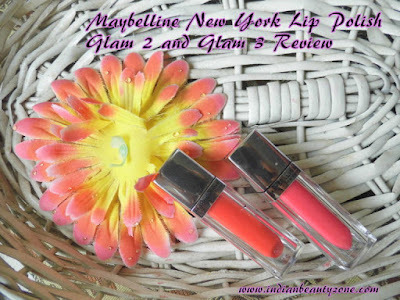 Maybelline New York Glam 2 lip polish is basically a pink shade that you can see it through the transparent packaging. When you apply it on your lips especially when you have pigmented lips it shows less pink and more coral. This shade has coral undertone with pink highlight. It is best suitable for fair skin tones. 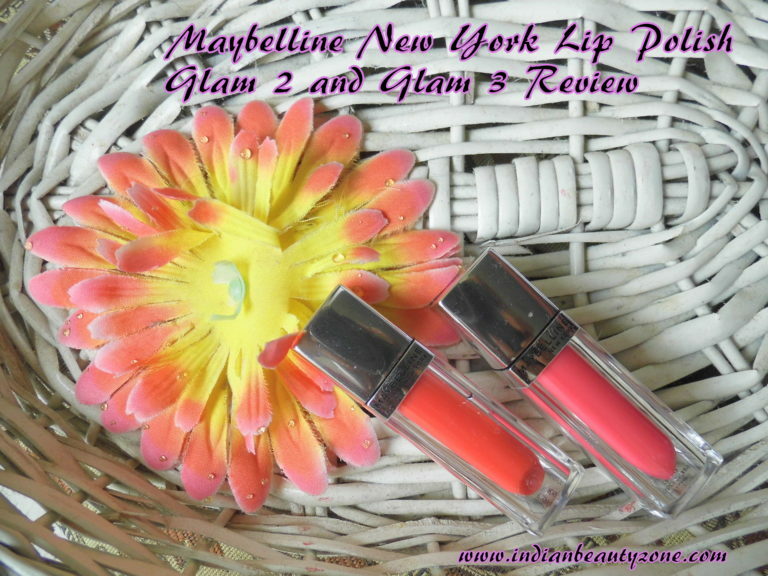 Maybelline New York Glam 3 lip polish is an orange shade with peach hint. This shade also doesn't shows it's orange colour on pigmented lips. It looks peachy on lips more than orange. This shade will suits for medium to fair skin tones. According to me Glam 3 is the best suitable shade for me than Glam 3. I am not comfortable with these lighter shades of lip polishes. Because they looks uneven on my pigmented lips when applied also I feel sticky all the time. If you accidentally wipe your lips the glitters in the lip polish will spread around your mouth and makes a messy look. There are visible golden glitters in this lip polish which is not everyone's cup of tea. I found when these lip polishes are used as top coat on your lipstick it makes longer staying time which is what now I am using them for where I can't use it alone on my pigmented lips. It is staying on lips around 4 to 5 hours without meals. Lot of shades available to choose. Both lipstick and lip gloss in one formula. Makes the lips fuller and shinier. Looks uneven on pigmented lips. Glam 2 is not suitable for medium to dusky skin tone. Feels sticky on the lips. 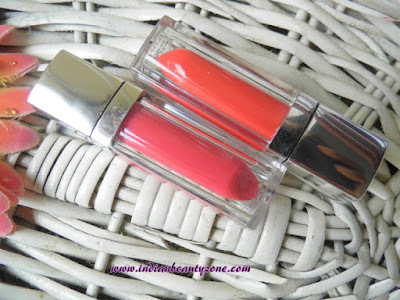 Maybelline New York Lip Polish is a lipstick + lip gloss combined formula which is useful for dry lips and those who use lip gloss regularly with lipstick. You have lot shade selection to choose. 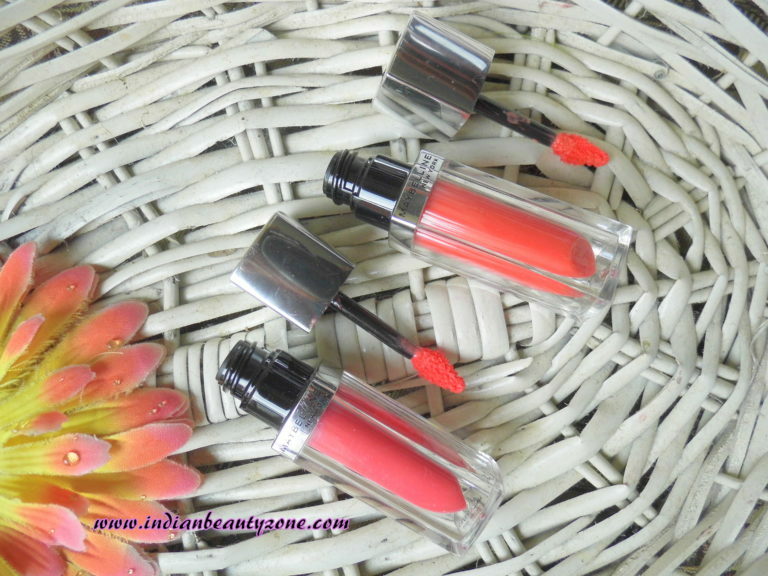 Choose bright and dark shades if you are dusky and have pigmented lips.